From the parking area, look for a brown sign with arrows pointing towards GWT No 001, Dougherty Basin, and Long Willow Bottom Reservoir. Continue north along the fence-lined trail for about 500 feet and pass through a gate. The trail turns west and briefly runs along a babbling creek. Another few hundred feet and you’re at a signed junction, where you keep left towards the fence. 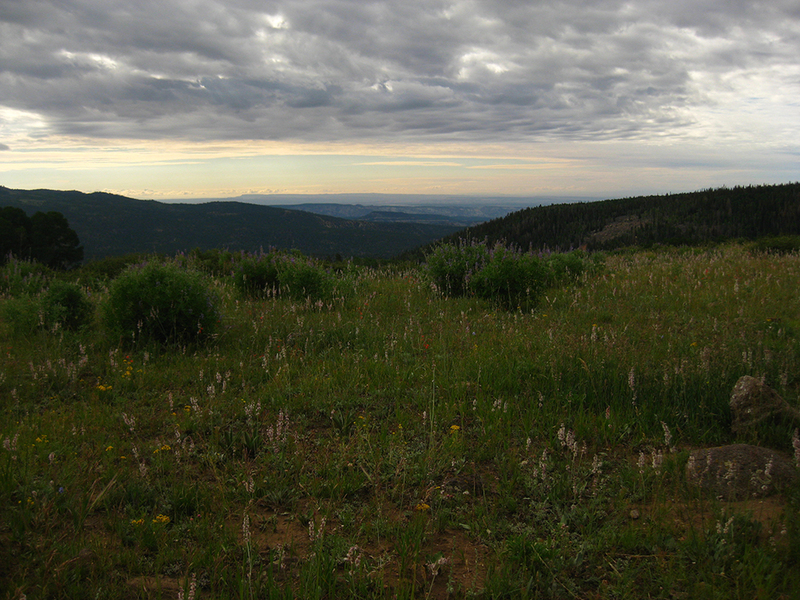 Throughout the hike, the trail alternately passes through grassy meadows, aspen groves, and stands of conifer trees. 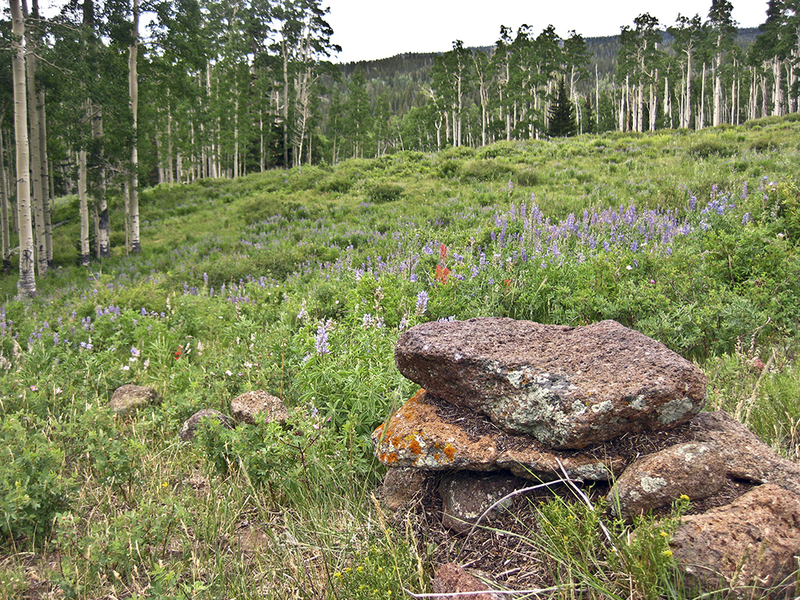 Lupine, Indian paintbrush, and showy goldeneye decorate the slopes as you contour around Escalante Mountain. You’re following part of the Great Western Trail (GWT), which covers 4,445 miles through Arizona, Utah, Wyoming, Idaho, and Montana, connecting the southern and northern U.S. borders. 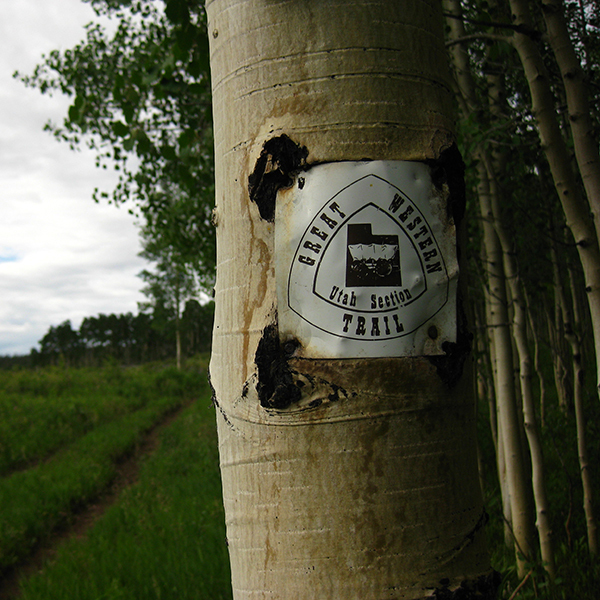 Small GWT tags are posted on the aspen trees along this section. Though much of the GWT is for motorized use, this section is nonmotorized. The trail gently gains elevation; when you reach a trail sign just before 0.5 mile, continue straight on the GWT. You pass through areas of spruce and fir trees, where the dense forest is littered with chopped and downed wood. The thick vegetation affords few views except when the trees open up to flower-filled meadows. Cross over a stream, and arrive at another trail junction around 1.2 miles. Veer right, following signs towards Long Willow Bottom Reservoir. As you climb up the side of a hill, the trail takes you past a primitive campsite. Long Willow Bottom Reservoir is just beyond. Cross a small bridge and arrive at the lovely shores at around 2 miles. 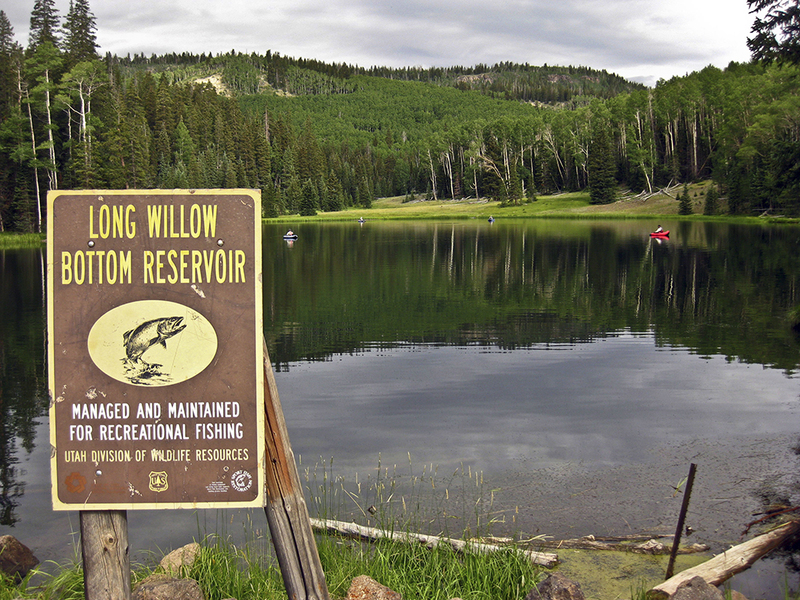 Long Willow Bottom Reservoir, with its placid waters and calming greenery, is a nice place to relax, have a picnic, perhaps throw a few casts. 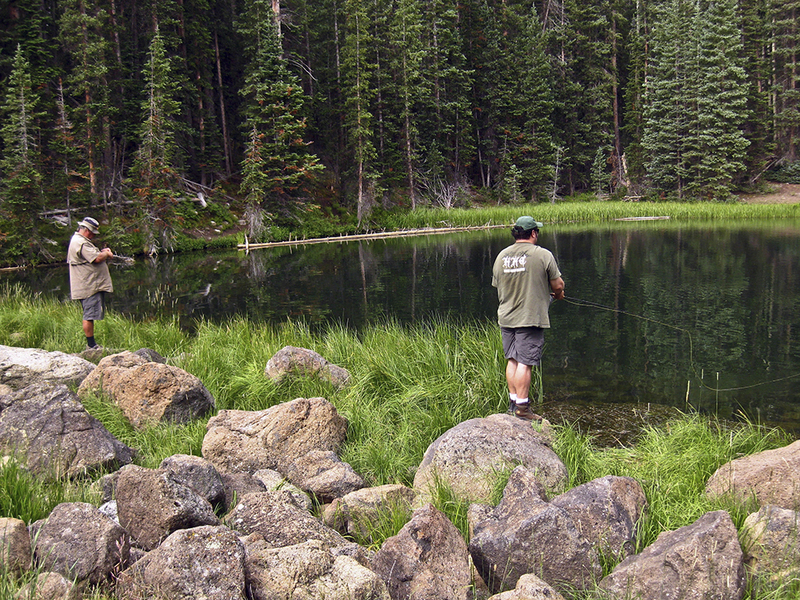 The Utah Division of Wildlife Resources stocks the reservoir with tiger trout and Colorado River cutthroat trout, making it a popular fishing hole. Be sure to check fishing regulations and have the appropriate permits. When you decide to call it a day, retrace your steps back to the trailhead. From Escalante, Utah, drive west on UT 12. A few miles after passing the turnoff towards Escalante Petrified Forest State Park, look for Main Canyon Road, between mile markers 55 and 56. Cross the Escalante River and turn right onto FR 149, following signs to Barker Recreation Area. This road parallels North Creek, and you pass North Creek Reservoir on your left. At about 12 miles, veer left to stay on FR 149. The road crosses several creeks continuing up to Barker Recreation Area. After passing over a cattle guard, continue past Barker Campground on FR 149 as it bends right towards Upper Barker Day Use Area. In a half mile you pass the righthand turnoff to Lower Barker Reservoir, but continue straight for another half mile before arriving at the Upper Reservoir parking area. Turn left and park your vehicle in the area designated as GWT Parking around 17 miles.